Zorba recommended daily exercises to a caller who was suffering from back pain. Checkout a video outlining the exercise. Zorba talked about a new study discounting the benefits of fish oil pills. Zorba chatted with a listener week about night terrors. Check out the article for more information. Check out Mayo Clinic's informative page on Drugs and Supplements mentioned by Zorba. Zorba mentioned having your PT or OT perform a neck exercise called "Epley's Maneuver" to help alleviate vertigo. Zorba discussed the surprising failure rates of the most popular forms of pregnancy prevention. In the fall of 2018, Tom Clark (along with his wife, Monika) visited London and rural England. And he brought back a few photos to prove it! During the show, Zorba and Tom discussed the rising awareness that strokes can strike at any age, especially in children and teenagers. Quoting ABC News' article on the issue, "stroke occurs with two to four times more frequency in children and teenagers than was previously thought." Zorba outlined some great ways to combat the pain from tennis elbow. Here are some recommended links to learn more about prevention of tennis elbow and an instructional video outlining some exercises that can strengthen the elbow. Zorba recommends combating Tinnitus with a white-noise machine (especially at night), protecting your ears if you work in a noisy profession (i.e. construction, factory, etc.) with earplugs and avoiding loud restaurants and public places. Zorba advises that any chest pains to be checked out by a doctor immediately. Zorba recently helped out a listener who was suffering from chest pains when looking down. When offering advice on controlling Blood Pressure, Zorba recommends a drastic reduction in salt in your diet, cutting back on the alcohol and making sure to get plenty of exercise even if you're at a healthy weight. For folks that suffer from S.A.D. (Seasonal Affective Disorder), Zorba recommends using a light box. He explains that SAD has little to do with temperature, but rather is a result of the limited daylight from the winter months. The lack of light decreases melatonin production. One of our listeners - John from Stoughton, WI - decided to set up a little challenge for our hosts. He baked and then hand delivered three different kinds of cookies to the WPR studios! He wanted to see if the guys could distinguish which one of his cookies was heart-healthy. Zorba chatted about Ultrasonic Humidifiers on the program and has suggestions on which models to look for. During a call with a woman about her husband's rash around his eyes, Zorba recommends washing the area around his eyes and his eyelids with a soapy solution. Zorba was helping a listener who was pickling some beets. She wanted to know if they were safe to eat. Here are Zorba's recommendations! Zorba chatted with a caller about leg swelling. He recommended trying on some compression hoisery to help the leg muscles get the blood flow back to the heart. Zorba looks at the practice of pill splitting as a cost saving measure for some medications. Zorba strongly recommends you talk with your doctor and pharmacist before splitting any pill, some pills (like BP meds) that are used for regulatory purposes need to adhere to strict dosage amounts. During a recent call with a soon-to-be father, Zorba recommended some resources to check out regarding safe medications to take during pregnancy. On such resource was the Physicians Resourse Desk website or PDR.net. Zorba spoke with a caller who was dealing with a compressed nerve in his shoulder. Zorba recommended he take 2 Aleve, twice a day (the anti-inflammatory dose) and advised that he work on some stretches for his shoulder. Zorba and Tom were discussing a new way to combat sleep apnea without the clunky CPAP machine. Zorba mentioned a new product from Provent which might be a nice, smaller alternative. Zorba helped out a listener who was suffering from excessive eye blinking. Zorba noted that some older anti-depressants can dry out the eyes, leading to blinking. Zorba often helps folks battle nail fungus. He often recommends a "nail polish" style solution called Penlac. Having problems swallowing those giant fish oil pills? As promised, here is the link to some smaller ones that Zorba recommends. Zorba recommended researching how antidepressants can affect pregnancy, check out Mayo Clinic's overview of the key issues. 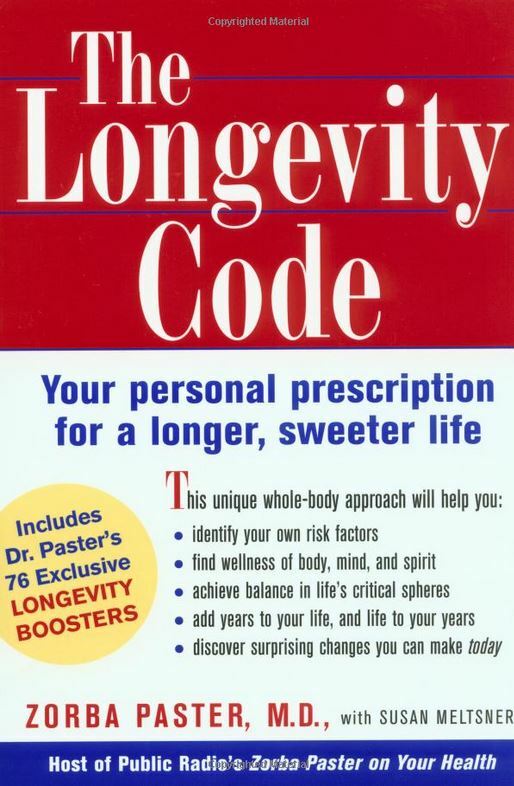 The Longevity Code: Your Personal Prescription for a Longer, Sweeter Life by Zorba Paster is $17.50 plus postage and handling. Order now from The Radio Store. You can also find it on Amazon. 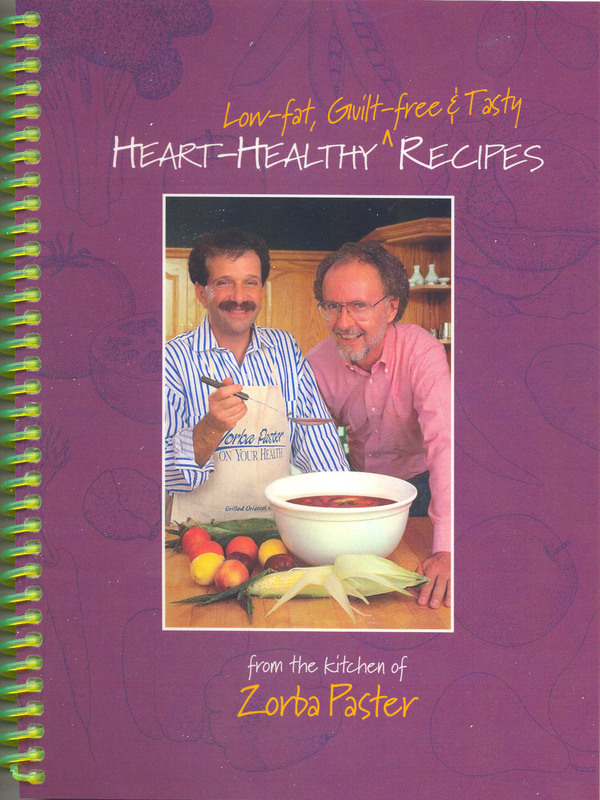 Heart-healthy, guilt-free, tasty recipes from Zorba Paster is just $13.00 plus shipping & handling. Order now from The Radio Store.